If you’ve followed any of our previous posts or looked around our website, you’ll know that mold is everywhere. You’ll also know that mold needs moisture and organic material (food) for growth. 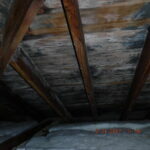 Today, we’ll identify five areas where mold can commonly grow. By knowing these areas you can take the proper steps, to protect your home from mold growth. The first area we encourage you to check to protect your home from mold growth is the refrigerator drip pan. Located under your refrigerator is a drip pan. This pan is used for collecting moisture from spills and condensation caused by the cooling element in the refrigerator. It’s important to clean your drip pan as this is a prime location for mold to grow. It’s damp, there’s usually organic material in the pan, and it’s a dark area. Another common area for mold to grow is in front loading wash machines. 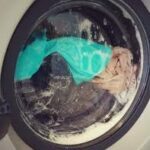 This happens because the front load door and rubber gasket get wet during the wash. When the washing machine is not in use, the door is typically closed. The closed door and gasket are still wet allowing mold to grow. When finished doing the laundry, it’s a good idea to wipe down the door and gasket to dry them thoroughly. You can also keep the door open to allow it to air dry. Next, we encourage you to check your window seals. It’s easy for condensation to collect on window seals from rain and dirt. Cleaning and wiping down the windows and their seals after a rain is an easy step to take to protect your home from mold growth. Without the moisture and the organic material (dirt) mold does not have a chance. If seals between windows are starting to fail, replacement is a wise choice. Did you know that dishes can be a place where mold growth can occur? This only happens when you stack dishes that are still wet leaving moisture to aid in mold growth. Be sure to thoroughly dry your dishes before they are stacked to prevent mold growth. Air conditioning units are another area where mold can grow. These units trap dirt and dust and then collect moisture from the air. This provides a perfect environment for mold to grow. It’s important to clean your air conditioning units to prevent mold growth and buildup.